FILE - Russian Deputy Prime Minister Igor Shuvalov attends a session on the third day of the annual meeting of the World Economic Forum in Davos, Switzerland, Jan. 19, 2017. A London property owned by Shuvalov could come under investigation using a new British law. Politicians, public figures and criminals suspected of buying property with corrupt money will be forced to explain their wealth or see their assets seized under new legislation that has come into force in Britain this month. The so-called Unexplained Wealth Orders (UWOs) have been welcomed by campaigners, who say the British capital is at the center of a global web of embezzled money. The anti-corruption organization Transparency International has identified five properties they say British authorities could immediately begin investigating using Unexplained Wealth Orders. Among them are two apartments overlooking the River Thames that are worth about $15 million. The Russian anti-corruption campaigner and opposition politician Alexey Navalny alleges the apartments are owned by the First Deputy Prime Minister of Russia Igor Shuvalov, whose self-declared annual salary is $157,000. So how exactly is Shuvalov able to afford the property? The new legislation should be used to investigate, said Rachel Davies Teka, head of advocacy at Transparency International. “An Unexplained Wealth Order could be served by the National Crime Agency or the Serious Fraud Office here in the UK. And that would say to that person, ‘OK, there’s a huge gap here, maybe that’s legitimate income, that’s fine, you just explain that to us, you show us the proof of this income and we’ll leave you alone.’ If that person is unable to do so, then law enforcement can then move to recover that asset,” she said. Britain’s National Crime Agency says that in excess of $100 billion of corrupt money flows through London each year, much of it public money stolen from government budgets. “Before UWOs came into force, it was very easy for corrupt politicians from overseas to take their wealth and actually bury it in the UK in sectors such as property,” Davies Teka said. FILE - The manor of Bashar al-Assad’s uncle, Rifaat al-Assad, is seen, in Bessancourt, north of Paris, Sept. 13, 2013. 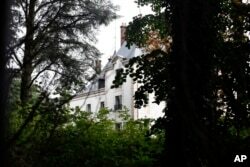 The manor whose real estate portfolio in the Paris region alone is estimated at Euros 160 million. A property in London, once owned by Rifaat al-Assad, was sold before it could be seized by authorities. Campaigners cite the case of an $18 million house in London’s Mayfair district, which until last year was owned by Rifaat al-Assad, the uncle of Syrian President Bashar al-Assad. Investigators believe he embezzled more than $300 million of state funds. He sold the house before it could be seized by authorities and claims his wealth comes from rich Arab backers. Those looking to hide their wealth often use a complex network of offshore holding companies to conceal their identity. “We still don’t have a register of the true owners of overseas companies that own UK property. And that’s a bit of a problem in actually identifying these massive gaps between income and asset in the first place,” Davies Teka said. Two kilometers away in London’s Belgravia district lies another property at the center of corruption allegations. The so-called “Paradise Papers” leak showed that the $20 million house is owned by Toyin Saraki, the wife of the president of the Nigerian Senate, Bukola Saraki. He says his assets are legitimately owned, but Transparency International says this house also should be investigated. Speaking to VOA in October, Nigeria’s Information Minister Lai Mohammed said his government is cracking down on corruption. “But we also need the cooperation of many foreign countries, because sometimes we are hampered by the foreign jurisdictions,” he said. Campaigners warn that the Unexplained Wealth Orders will prove effective only if the British government is willing to use them and show it is serious about ending London’s central role in global corruption.